Qosina offers an extensive line of Check Valves available in a variety of styles that are in stock and ready for immediate delivery. Made of SAN, MABS, and silicone, Qosina part # 80506 features a low, 0.087 psi cracking pressure ideal for infusion, drainage and irrigation applications. This barbed check valve accommodates 3/32 inch ID tubing on the inlet and a male luer lock outlet. It provides controlled directional flow, and eliminates the need for bonding. Qosina offers a variety of flow rates, materials, cracking pressure and back pressure options. Check Valve sample kits are also available which are ideal for testing. Qosina offers an extensive line of Check Valves available in a variety of styles that are in stock and ready for immediate delivery. Made of SAN, MABS, and silicone, Qosina part # 80507 features a low, 0.087 psi cracking pressure ideal for infusion, drainage and irrigation applications. This barbed check valve accommodates 1/8 inch ID tubing on the inlet and a male luer lock outlet. It provides controlled directional flow, and eliminates the need for bonding. Qosina offers a variety of flow rates, materials, cracking pressure and back pressure options. Check Valve sample kits are also available which are ideal for testing. Qosina offers an extensive line of Check Valves available in a variety of styles that are in stock and ready for immediate delivery. Made of SAN, MABS, and silicone, Qosina part # 80504 features a low, 0.087 psi cracking pressure ideal for infusion, drainage and irrigation applications. This barbed check valve is equipped with a female luer lock inlet and fits 3/32 inch ID tubing on the outlet. It provides controlled directional flow, and eliminates the need for bonding. Qosina offers a variety of flow rates, materials, cracking pressure and back pressure options. Check Valve sample kits are also available which are ideal for testing. Qosina offers an extensive line of Check Valves available in a variety of styles that are in stock and ready for immediate delivery. Made of SAN, MABS, and silicone, Qosina part # 80505 features a low, 0.087 psi cracking pressure ideal for infusion, drainage and irrigation applications. This barbed check valve is equipped with a female luer lock inlet and fits 1/8 inch ID tubing on the outlet. It provides controlled directional flow, and eliminates the need for bonding. Qosina offers a variety of flow rates, materials, cracking pressure and back pressure options. Check Valve sample kits are also available which are ideal for testing. Qosina offers an extensive line of Check Valves available in a variety of styles that are in stock and ready for immediate delivery. Made of MABS and Silicone, Qosina part # 80500 features a low, 0.087 psi cracking pressure ideal for infusion, drainage and irrigation applications. This barbed check valve fits 3/32 inch ID tubing, provides controlled directional flow, and eliminates the need for bonding. Qosina offers a variety of flow rates, materials, cracking pressure and back pressure options. Check Valve sample kits are also available which are ideal for testing. Qosina offers an extensive line of Check Valves available in a variety of styles that are in stock and ready for immediate delivery. Made of MABS and Silicone, Qosina part # 80501 features a low, 0.087 psi cracking pressure ideal for infusion, drainage and irrigation applications. This barbed check valve fits 3/32 inch ID x 1/8 inch ID tubing, provides controlled directional flow, and eliminates the need for bonding. Qosina offers a variety of flow rates, materials, cracking pressure and back pressure options. Check Valve sample kits are also available which are ideal for testing. Qosina offers an extensive line of Check Valves available in a variety of styles that are in stock and ready for immediate delivery. Made of MABS and Silicone, Qosina part # 80502 features a low, 0.087 psi cracking pressure ideal for infusion, drainage and irrigation applications. This barbed check valve fits 1/8 inch ID x 3/32 inch ID tubing, provides controlled directional flow, and eliminates the need for bonding. Qosina offers a variety of flow rates, materials, cracking pressure and back pressure options. Check Valve sample kits are also available which are ideal for testing. Qosina offers an extensive line of Check Valves available in a variety of styles that are in stock and ready for immediate delivery. Made of MABS and Silicone, Qosina part # 80503 features a low, 0.087 psi cracking pressure ideal for infusion, drainage and irrigation applications. This barbed check valve fits 1/8 inch ID tubing, provides controlled directional flow, and eliminates the need for bonding. Qosina offers a variety of flow rates, materials, cracking pressure and back pressure options. Check Valve sample kits are also available which are ideal for testing. Qosina offers an extensive line of Check Valves, available in a variety of styles that are in stock and ready for immediate delivery. 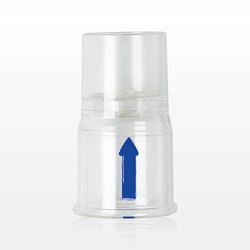 Made of k-resin and latex, Qosina part # 51465 is respiratory connector that provides direction flow of gases and air and has an arrow that indicates the direction of air flow. Qosina offers a variety of flow rates, materials, cracking pressure and back pressure options. Check Valve sample kits are also available which are ideal for testing. Qosina offers an extensive line of Check Valves, available in a variety of styles that are in stock and ready for immediate delivery. 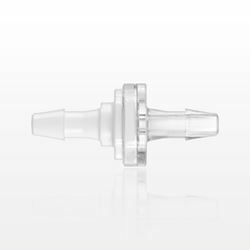 Made of k-resin and polyisoprene rubber, Qosina part # 51464 is respiratory connector that provides direction flow of gases and air and has an arrow that indicates the direction of air flow. Qosina offers a variety of flow rates, materials, cracking pressure and back pressure options. Check Valve sample kits are also available which are ideal for testing. Qosina offers an extensive line of Check Valves, available in a variety of styles that are in stock and ready for immediate delivery. Qosina part #80130 features a blue tubing port inlet and clear tubing port outlet that fits 0.122 inch ID x 0.165 inch OD tubing. Made of polycarbonate and silicone, this in-line valve has a low, 0.014 - 0.087 psi cracking pressure range, determining when the component starts to open. Qosina offers a variety of flow rates, materials, cracking pressure and back pressure options. Check Valve sample kits are also available which are ideal for testing. Qosina offers an extensive line of Check Valves, available in a variety of styles that are in stock and ready for immediate delivery. 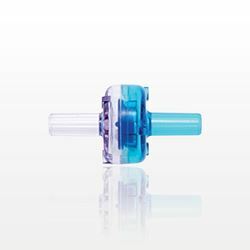 Qosina part # 80184 features a blue male luer slip inlet and clear male luer slip outlet. Made of ABS and silicone, this in-line valve and has a low, 0.27 psi cracking pressure that determines when the component starts to open. Qosina offers a variety of flow rates, materials, cracking pressure and back pressure options. Check Valve sample kits are also available which are ideal for testing. Qosina offers an extensive line of Check Valves, available in a variety of styles that are in stock and ready for immediate delivery. Qosina part # 80393 features a clear, 0.138 inch OD tubing port inlet and a blue, 0.138 inch OD tubing port outlet. 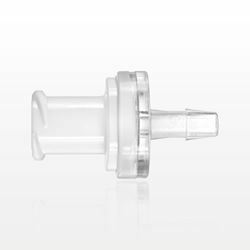 Made of polycarbonate and silicone, this in-line valve and has a low, 0.25 psi cracking pressure, determining when the component starts to open and can withstand 45 psi of back pressure. Qosina offers a variety of flow rates, materials, cracking pressure and back pressure options. Check Valve sample kits are also available which are ideal for testing. Qosina offers an extensive line of Check Valves, available in a variety of styles that are in stock and ready for immediate delivery. 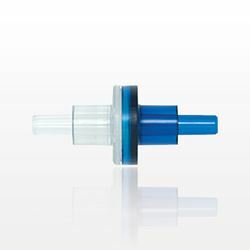 Qosina part #80068 features a clear inlet and blue outlet that has a 0.124 inch OD on each end. Made of MABS and silicone, this in-line valve has a low, 0.142 psi cracking pressure which determines when the component starts to open. Qosina offers a variety of flow rates, materials, cracking pressure and back pressure options. Check Valve sample kits are also available which are ideal for testing. Qosina offers an extensive line of Check Valves, available in a variety of styles that are in stock and ready for immediate delivery. Qosina part # 80185 features a female luer lock inlet and male luer lock outlet with a 1.5 - 5 psi cracking pressure. 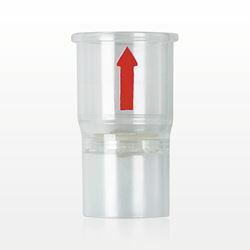 Made of polycarbonate and silicone, this in-line check valve is ideal for infusion, drainage and irrigation applications. Qosina offers a variety of flow rates, materials, cracking pressure and back pressure options. Check Valve sample kits are also available which are perfect for testing. Qosina offers an extensive line of Check Valves, available in a variety of styles that are in stock and ready for immediate delivery. Qosina part # 80054 features a female luer lock inlet and a male luer lock outlet with a low, 0.17 psi cracking pressure. Made of COPE and silicone, this in-line check valve is ideal for infusion, drainage and irrigation applications. Qosina offers a variety of flow rates, materials, cracking pressure and back pressure options. Check Valve sample kits are also available which are ideal for testing. Qosina offers an extensive line of Check Valves, available in a variety of styles that are in stock and ready for immediate delivery. Qosina part #80107 features a female luer lock inlet and male luer lock outlet. 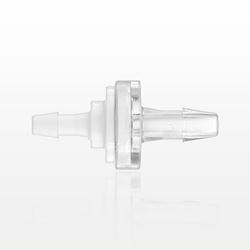 Made of polycarbonate and silicone, this in-line valve is tinted for gamma sterilization and has a 1.5 - 5 psi cracking pressure range, determining when the component starts to open. Qosina offers a variety of flow rates, materials, cracking pressure and back pressure options. Check Valve sample kits are also available which are ideal for testing. Qosina offers an extensive line of Check Valves, available in a variety of styles that are in stock and ready for immediate delivery. Qosina part #80129 features a female luer lock inlet and male luer lock outlet. 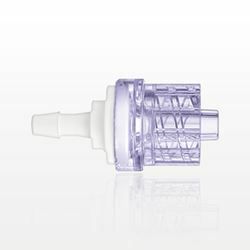 Made of polycarbonate and silicone, this in-line valve is tinted for gamma sterilization and has a 0 - 10 psi cracking pressure range, determining when the component starts to open. Qosina offers a variety of flow rates, materials, cracking pressure and back pressure options. Check Valve sample kits are also available which are ideal for testing. Qosina offers an extensive line of Check Valves, available in a variety of styles that are in stock and ready for immediate delivery. Made for Qosina by B. Braun, part # QOS5401020SN features a female luer lock inlet and male luer lock outlet with a 1.5 - 5 psi cracking pressure. 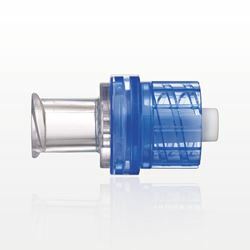 Made of polycarbonate and silicone, this in-line check valve is ideal for infusion, drainage and irrigation applications. Qosina offers a variety of flow rates, materials, cracking pressure and back pressure options. Check Valve sample kits are also available which are perfect for testing. Qosina offers an extensive line of Check Valves, available in a variety of styles that are in stock and ready for immediate delivery. 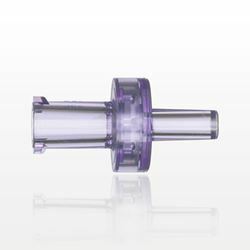 Made of polycarbonate and silicone, this valve is lipid resistant, and displays stress-crack resistance when it makes contact with lipid emulsions. Qosina part # 11582 has a female luer lock inlet and male luer lock outlet. Qosina offers a variety of flow rates, materials, cracking pressure and back pressure options. Check Valve sample kits are also available which are ideal for testing. Qosina offers an extensive line of Check Valves, available in a variety of styles that are in stock and ready for immediate delivery. Qosina part #80058 features a female luer lock inlet and male luer slip outlet. This in-line valve has a low, 0.112 psi cracking pressure which determines when the component starts to open. 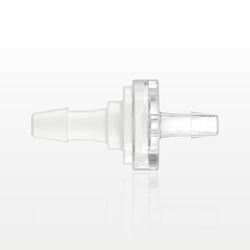 Made of polycarbonate and silicone, this duckbill valve style is ideal for applications where back pressure is a concern. Qosina offers a variety of flow rates, materials, cracking pressure and back pressure options. Check Valve sample kits are also available which are ideal for testing. Qosina offers an extensive line of Check Valves, available in a variety of styles that are in stock and ready for immediate delivery. Qosina part # 80188 features a female luer lock inlet and male luer slip outlet. 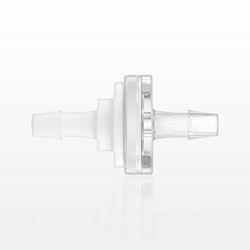 Made of polycarbonate and silicone, this in-line valve is tinted for gamma sterilization and has a 1.5 - 5 psi cracking pressure range, determining when the component starts to open. Qosina offers a variety of flow rates, materials, cracking pressure and back pressure options. Check Valve sample kits are also available which are ideal for testing. 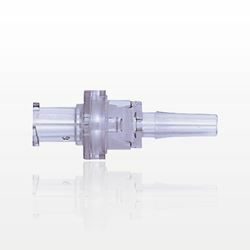 Qosina offers an extensive line of medical check valves available in a variety of styles, in stock and ready for immediate delivery. High-flow valves feature low flow resistance, low opening pressure, and a positive seal against backflow. In-line check valves feature low cracking pressures, which determine when the valve will start to open. If back pressure is a concern, choose from our variety of duckbill check valves. 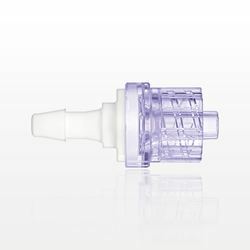 Luer activated check valves are equipped with a needle-free design that features a closed silicone plug that blocks flow until mechanically opened with a male luer connector. 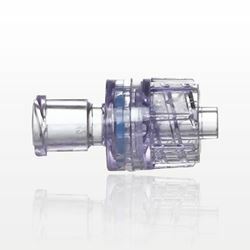 Dual check valves enable injection and aspiration from separate ports of a single connector. Qosina offers components from various check valve manufacturers in assorted flow rates, materials, cracking pressure and back pressure options. Single-use medical device check valve sample kits are also available for purchase and are ideal for testing. 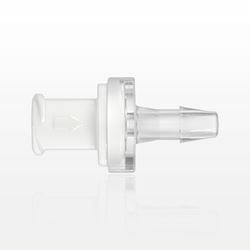 In stock and available for immediate delivery, DEHP-free, acrylic in-line check valves feature latex-free silicone diaphragms that allow flow in one direction and will prevent retrograde flow (back pressure tested to various psi ratings). These in-line check valves have various cracking pressure ratings, and feature a versatile design making it a superior choice for inclusion. Qosina stocks a variety of check valves to complete your project including one-way duckbills, high flow and in-line, along with luer activated and dual check valves.